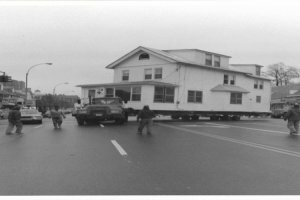 Originally located on Holly Avenue, when threatened by demolition, the historic Lewis Latimer House was moved to its current home in Leavitt Field in 1988. It served as the home of the African-American inventor Lewis Howard Latimer from 1903 to 1928, and is now operated as a museum dedicated to the inventor’s work. In addition, this historic house museum also illuminates the life and achievements of other distinguished African-American scientists .A group of citizens, led by Tom Lloyd and Rev. Mitchell with assistance from the Queens Historical Society quickly formed the Committee to Save the Latimer House and launched a major campaign in order to preserve the historic house from imminent destruction.